Try this refreshing and appetizing summer cold dish! 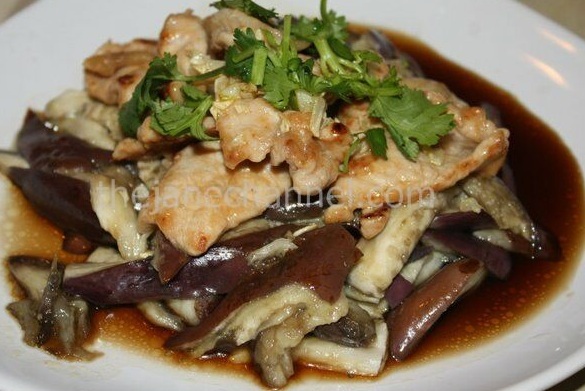 Eggplant shredded in matchstick-style and tossed with a garlicky soy sauce vinaigrette. Raw eggplant absorbs oil like a sponge, so it is not preferable to cook it directly with oil as otherwise you will oil-soaked eggplant, which isn’t very appetizing. Steaming is one of the best way to cook eggplant. It allows better absorption of flavorings and quicker cooking. Serve as an appetizer or side dish with BBQ meat or simply as a main dish with rice or noodles. Marinate pork using 1 tablespoon soy sauce, 1 tablespoon oyster sauce, 1/2 teaspoon sugar, 1 teaspoon sesame oil, and 1 teaspoon corn starch for 30 minutes. Heat oil in wok over medium-high heat. Add pork, cook for 5 minutes, or until cooked through. Set aside and cool. Cut the eggplant in half and steam over high heat until softened (about 5 minutes). Remove from the heat and cool. In a bowl, combine the sauce ingredients. Use hands to tear eggplant into strips. Top with pork and cilantro. Then pour the sauce over to serve. Thanks on your marvelous posting! I quite enjoyed reading it, you could be a great author.I will remember to bookmark your blog and will often come back at some point. I want to encourage you to continue your great writing, have a nice morning!